Approaching Nisiros you are impressed by perfectly white houses, dense greenery, and the colours of the dark volcanic soil. Nissiros, was known in antiquity as Porphyris. Mythology holds that once it was united with Kos and that when Poseidon was chasing the giant Polyvotis, he split the two islands asunder. The capital of Nissiros is built at the foot of a steep hill which used to be fortified in the Middle Ages. To the northwest of the capital, clinging to the tip af a tall rock, lies the monastery of the Madona of the Caves (Panagia Spiliani), the patroness of the island. Built in 1600, it is linked with many traditions and has a lovely 18th century iconostasis.Every year a huge feast takes place here, with lots of food and drink. Yet another castle erected by the Knights of St. John looms above the small town. In the town-hall and the primary school there is an archaelogical collection with sculptures, ceramics, Hellenistic and Roman inscriptions and 18th/19th -century icons.
. To the northeast of Mandraki lies Palon, a fishing village with an excellent beach for swimming. Another village, Emborios, lies to the southeast of Mandrake in the interior of the island, in a lush area with mineral springs and planted with olive trees, fruit trees, fig trees and grapevines. The island's hot springs, fabled since antiquity and still in use today, are to be found at Loutra just 1,5 kilometres from Mandraki. 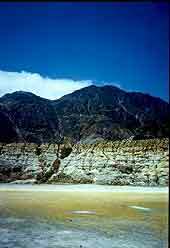 You have to go almost to the middle of Nisyros to the Lakki plateau, to see the crater of the extinct volcano, Polybates. It is 260 metres in diameter and 30 metres deep with steps leading down to its centre. The reek of sulphur fills the surrounding air, while the scenery could belong to the moon. Nisyros is blessed with many lovely beaches: at Mandraki, Hochlaki, Agia Irini, Avlaki and on Giali, the islet directly opposite. Because of its volcanic soil, Nisyros is very fertile. Its inhabitants take great care to preserve their traditions. One of them is their mariage festivities. Mandraki – The main harbor of Nisiros there is mole and quay to tie onto. During high meltemi winds the harbor can become uncomfortable and even dangerous. Provisioning is available and several tavernas. Palon - This harbor lies 2 miles E of Mandraki. There is a mole to tie on and it offers good shelter form the meltemi. Make sure to eat some fresh fish at one of the many tavernas. There is also a mini market for provisioning.